Neubourg Pharma UK announces the launch of Allpresan Diabetic Foot Foam Creams into the UK, clinically formulated to treat and prevent dry cracked skin and calluses on diabetic feet, the first clinically and medically approved to be used between toes safely. 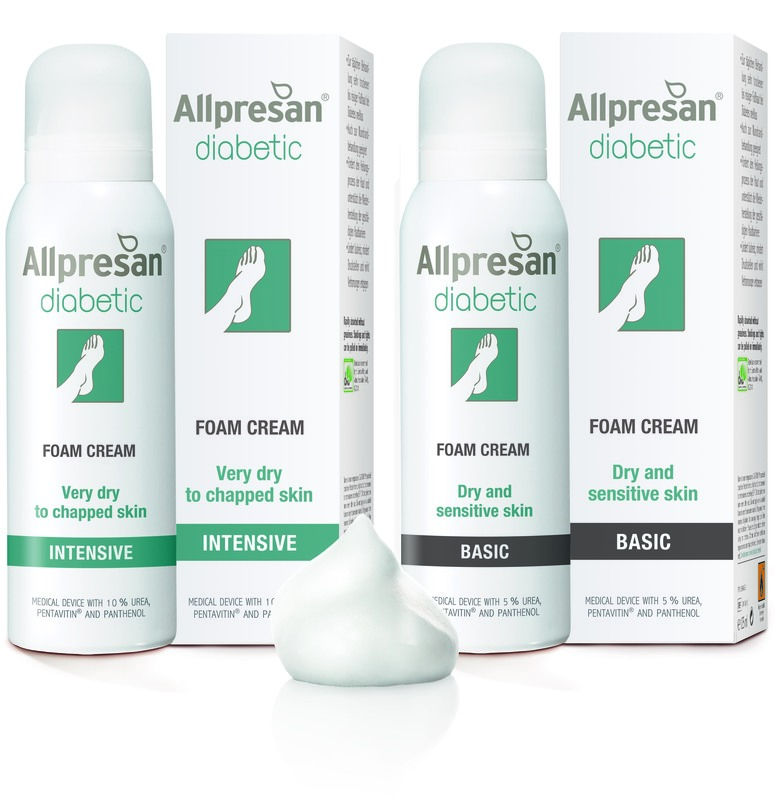 Allpresan Diabetic Foot Foam Creams launch into the UK, clinically formulated to treat and prevent dry cracked skin and calluses on diabetic feet, the first clinically and medically approved to be used between toes safely. Unlike conventional creams, it is unique at protecting against the real risk of infection in this area. Until now, clinician advice for diabetics has been not to use creams between toes. Allpresan Diabetic Foam Creams have been clinically approved for safe usage on the entire foot including between the toes. Unlike conventional creams, it is unique at protecting against the real risk of infection in this area. Allpresan® Foam Creams are clinically formulated to treat and prevent dry skin on diabetic feet, reduce cracks and the build up of hard skin and calluses, counteract pressure marks and protect against infection and ulceration. This is achieved because of Allpresan’s patented actively breathable formula and unique moisturising complex of Urea, Pentavitin® and Panthenol. When the foam is applied, it forms a two-dimensional protective mesh on the skin, so skin is able to breathe and is protected from external influences, such as bacteria. Dr Bristow believes that foot care for people with diabetes, prevention is most definitely better than cure. ‘A well-known phrase in podiatry is ‘give diabetes an inch and it will take a foot’. An estimated 80% of diabetics can suffer with some form of skin problem as a consequence of high blood sugar levels and most visible skin conditions are on the legs and feet. Typical symptoms include extreme dryness, calluses, pressure ulcers, cracks on the feet, foot fungus and the slightest wound being a real risk for infection. When skin becomes dry and cracked, it is easier for bacteria to get in, posing a risk of infection and, foot fungus and it is harder for these infections to heal. This can escalate quickly and lead to ulceration. For some people with diabetes, the end result of a foot ulcer can be amputation. Intensive daily foot care must include an appropriate regime to replenish the skin’s moisture and fat content, and create a protective layer against the outside environment. Areas not protected on the feet, including between toes, poses a risk of infection as bacteria can enter through the skin. As creams can cause accumulation of moisture and maceration, advice previously given to diabetics is not to use them between toes as additional moisture makes the skin more susceptible to bacterial growth and increase the risk of infection. The horny layer of the skin (outermost layer of the epidermis) protects against the entry of damaging substances, for example, fungal pathogens and/or bacteria. If the fat and moisture content of the horny layer decreases, as in the case of dry skin, the horny layer loses its protective function. As Allpresan® can be used between the toes, it is unique in protecting against the real risk of' infection in this area and the entire foot, making it easier for diabetics to apply without having to worry what areas to avoid. Richard Lane, OBE, long time Type 1 diabetic, wants to give a very personal endorsement, and says: “I have personally been using Allpresan for the past six months, replacing the cream I had been using for some years. I can honestly say that I have noticed a distinct improvement in my feet in that they are not nearly as dry as they have historically been. This is the best and most effective cream that I have ever used." Allpresan INTENSIVE 10% Urea is for very dry to cracked skin at risk of infection and ulceration in patients with diabetes mellitus. Allpresan BASIC 5% Urea is a preventive treatment for dry, sensitive and parchment like foot skin in diabetic patients. With a heritage of almost 20 years in skin care for diabetes mellitus in Germany, the company has now expanded its business to the United Kingdom and have launched their innovative foam creams to help diabetic patients suffering with diabetic foot syndrome. In 1998 foam cream pioneer Fritz Neubourg fundamentally revolutionized foot care for diabetics and in 1999 dermatological studies led to a specific active formula for the skin of diabetics, and thus the Allpresan® patented brand was launched. In 2004, a state-of-the-art distribution centre was built in Grevan and in 2006 the company moved into new, energy efficient headquarters where Dr Thomas Neubourg took over as Managing Director of the dynamic family company who employs around 60 people.